This 2-CD set contains the largest available collection of both Liszt's original piano music and his most famous transcriptions and paraphrases. Included are all the Etudes, Sonatas and other major concert works, concertos, 19 Hungarian Rhapsodies, and many easier pieces for students. Paraphrases include all 9 Beethoven Symphonies, Schubert Songs, Bach organ works, Verdi and Wagner operas, and many more. 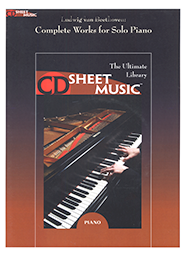 This 2-CD set contains over 3700 pages of music.